How Many Calories Does Lettuce Have? Lettuce is often referred to as a "free food" because you can have a lot of it for a very small amount of calories. 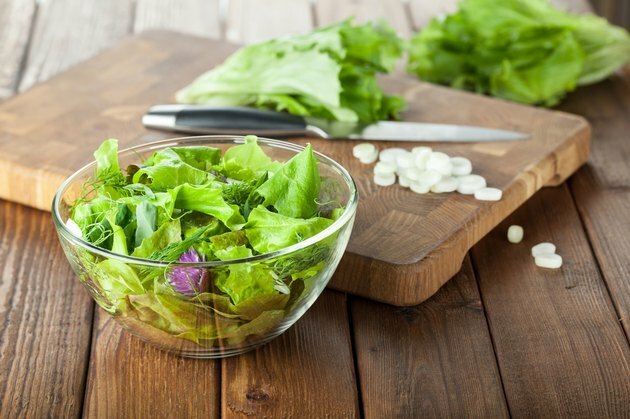 While lettuce does give you calories from carbohydrates, protein and fat, it also has a high water content. The large amount of water gives the leafy greens a lot of bulk to fill your belly, without further upping the calorie content. All types of lettuce have roughly the same number of calories. Whether you prefer red leaf, green leaf, iceberg, romaine or Bibb lettuce, you'll get a similar number of calories. A 3-ounce portion of any of these types of lettuce, which amounts to 85 grams by weight, provides between 10 and 15 total calories. Of the macronutrients, carbohydrates contribute the greatest number of calories in lettuce. Each 3-ounce serving of lettuce contains roughly 1.1 to 2 grams of carbohydrates, with each gram offering 4 calories. This equates to 4.4 to about 8 calories from carbohydrates in your bed of lettuce. Between 45 percent and 65 percent of your calories need to come from carbohydrates, the publication "Dietary Guidelines for Americans, 2010" points out. Following a 2,000-calorie diet, for example, means that you'll need 900 to 1,300 calories from carbohydrates. You won't get anywhere near that recommendation from lettuce, though. Your 3-ounce portion has less than 1 percent of your daily carb allowance for a 2,000-calorie diet. You'll get a small amount of protein from lettuce, which makes up some of the calorie content. One 3-ounce serving contains 0.76 to 1.16 grams of protein. All protein has 4 calories in a gram, meaning your portion of lettuce gives you 3 to 4.6 calories from protein. Ideally, protein should make up 10 percent to 35 percent of your caloric intake, or 200 to 700 calories from protein. Having 3 ounces of lettuce takes up less than 2 percent of your daily protein requirement for a 2,000-calorie diet. While not a major contributor to calories, your favorite lettuce does have a trace amount of fat. You'll get between 0.12 and 0.26 gram of fat from your 3-ounce serving of lettuce. Because fat has 9 calories per gram, this amounts to a mere 1 to 2.3 calories from fat. That's far less than 1 percent of your fat recommendation for the day, though. You should be getting 20 percent to 35 percent of your calories from fat. Based on 2,000 calories, that's 400 to 700 calories from fat. Which Gives You More Energy, Meat or Vegetables?